Food Grade Chain Lubricant is designed for extreme pressure. Based on renewable resource oils, LU™205 is treated with anti-oxidantsÂ as well asÂ extreme pressure, anti-wear, and corrosion protecting additives. PTFE is added to further optimize load capacity and minimize friction. Free of heavy metals, NSFÂ® H1-Rated product offers water resistance and temperature range of 12–450Â°F. Foaming action allows for pin-point application and deep penetration. 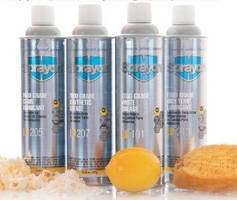 Cleveland, OH -- Sprayon® Products, the long-standing leader in delivering reliable, innovative solutions for the most demanding industrial and MRO applications, is proud to introduce the LU™205 Food Grade Chain Lubricant as part of our expanded line of NSF® H1-Rated Food Grade Lubricants.